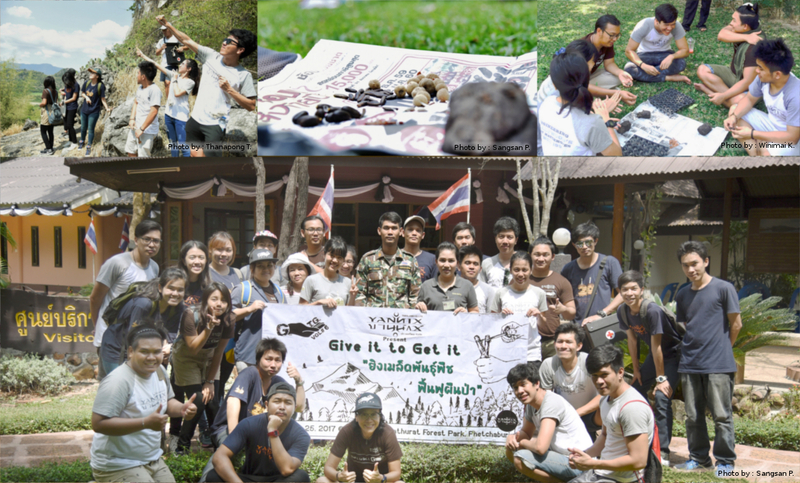 “Seed Bombs and Slingshots in the Nang Phan Thu Rat Forest Park ” (Give It to Get It #6) – Yannix(Thailand)Co.,Ltd. Under the guidance of Forest Protection Officers, Ms. Tassanee Chanvichit and Mr. Rapeepat Sangkudlor, Yannix employees were educated regarding the background of the Royal Initiated Mountain Area Conservation Project, and then were afforded an opportunity to work alongside local volunteers in a collective effort to restore the forest and increase the biological diversity of the plant life on the mountain, which is largely comprised of limestone. Because these cliff areas are limestone, re-forestation is a challenge. On this particular day, Yannix volunteers became stewards of the forest by, among other things, hiking to the forest cliff area, where they collected and removed trash. Those in attendance also learned how to mold clay, how to make seed composts (which were launched into the air with slingshots), and how to harvest mature seeds for a variety of seed strains including: Silver Trumpet trees, Teak, Flame-Trees, Leucaena plants, Diospiros fruit, Rhodocalyx plants, Sterculia Foetidas trees, Afzelia trees and Banyan trees.